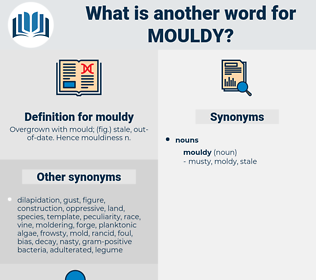 What is another word for mouldy? Overgrown with mould; ( fig.) stale, out-of-date. Hence mouldiness n.
Kropotkin was now within the gate of the Cemetery for the Living, the mouldy, murderous Tomb of Torture. I do feel really quite mouldy. 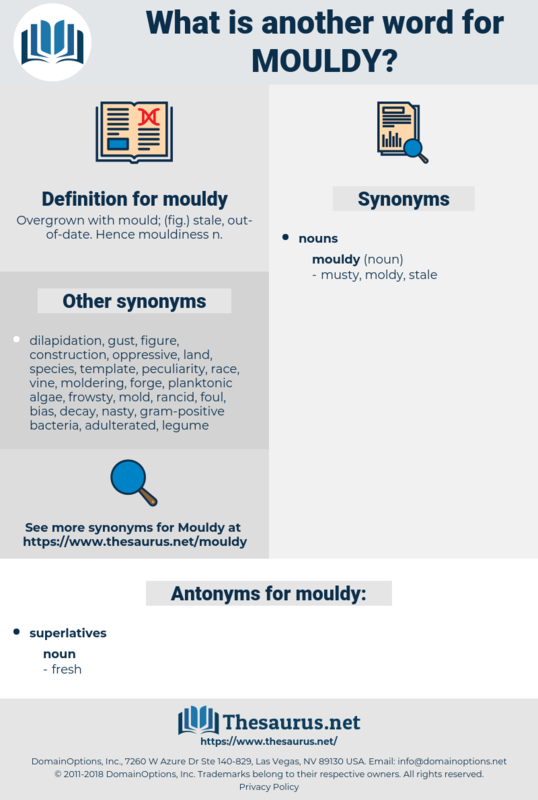 mlitt, millet, meld, milady, multitude, maillot, mylitta, mail out, mellow out, millettia, maleate, malt, mold, meloid, molt, milt, melt, melody, molded, militate, malted, monolith, mould, maltha, malady, moult, mullidae, mullet, myeloid, milhaud, moonlit, molality, malto, mildew, malta, mulatto, melilot, militia, melted, milled, molidae, meloidae, milliwatt, mellowed, mallet, mild, moldy, mailed.